George W. Smith, Jr. of Lawrence, Kansas Territory, requests a supply of "arms . . . for distribution among the Free State men who have formed themselves into Companies." Smith's signature identifies him as Captain, "Munger Battalion, Free State Forces." 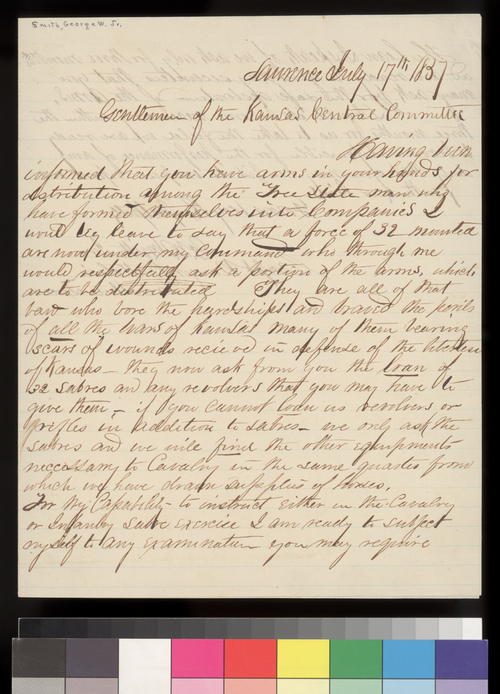 Smith writes that he led "a force of 32 mounted" men, most of whom were veterans of the "wars of Kansas," and requests the loan of "32 sabres [sic] and any revolvers that you may have to give them."